If I've said it once, I've said it a million times...I love hedgehogs! 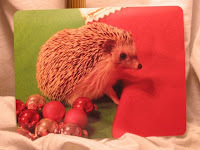 Rhymes with Twee has the cutest postcards featuring Hoggle, an African Pygmy hedgehog. The breakup bandage is a unique way to show the world that your heart is in fact broken. I really love the baby onsies featuring old school mix tape images. And I'd be remiss if I did not bring your attention to the sad croissant and the cute artichoke. I absolutely share the same love for cute little hedgehogs too!! I just absolutely love the name of that shop!